This year we will use Journeys for our Literacy instruction. Although we will use a basal, I am going to try to create a schedule that runs like a reading workshop. 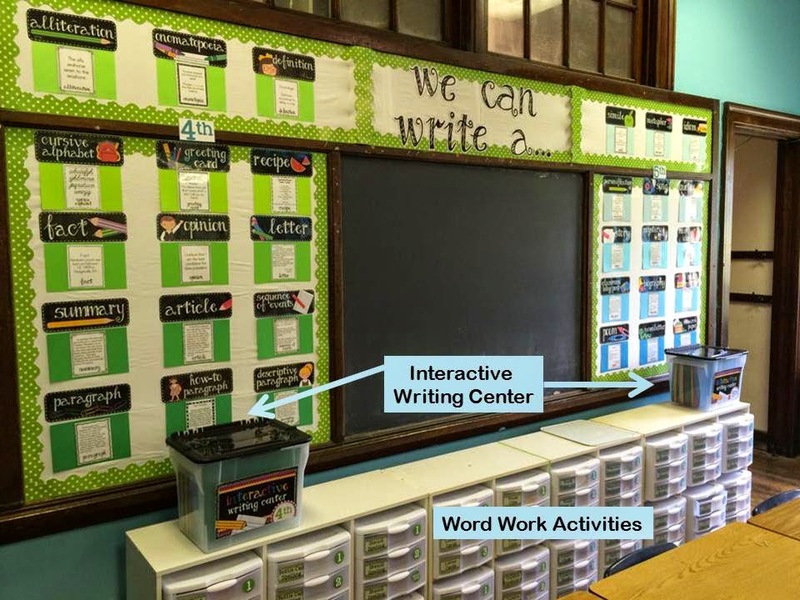 During the time that I work with students, some of my students will work on word work activities and an interactive writing center (created by Jody Udovich, which is Uh-mazing). 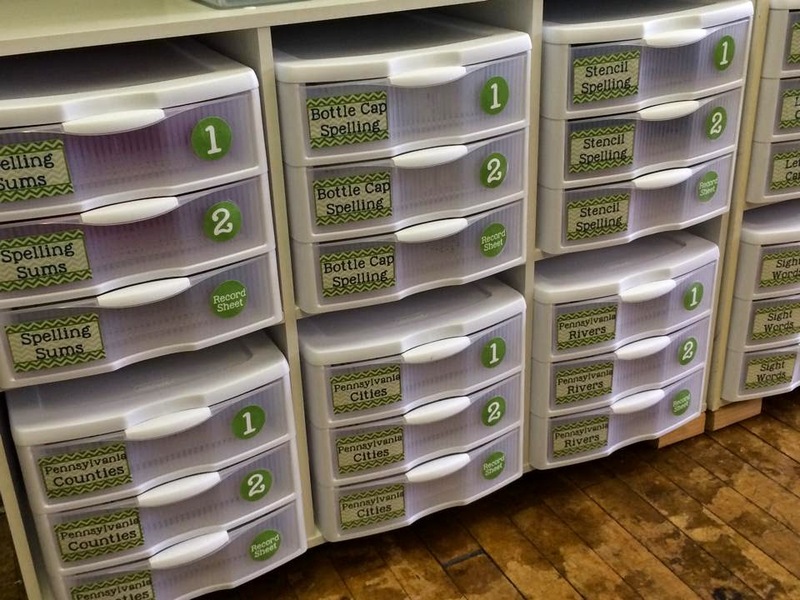 My word work centers are housed in plastic drawers and the writing center is housed in a file box. (see photo) There are more photos of my new classroom HERE. I've posted about my word work centers before. Some of them are the same as before, while I've added others. 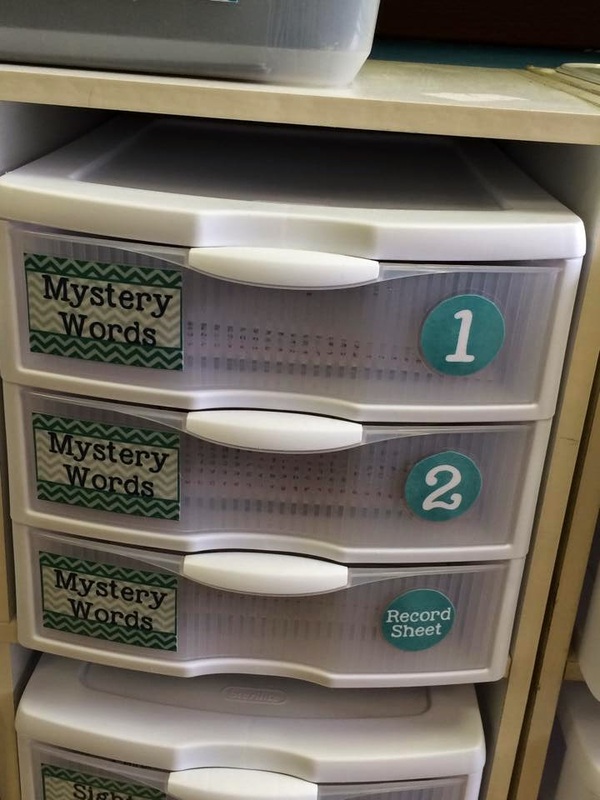 This particular word work activity has two drawers (so enough for two kids) and a record sheet. 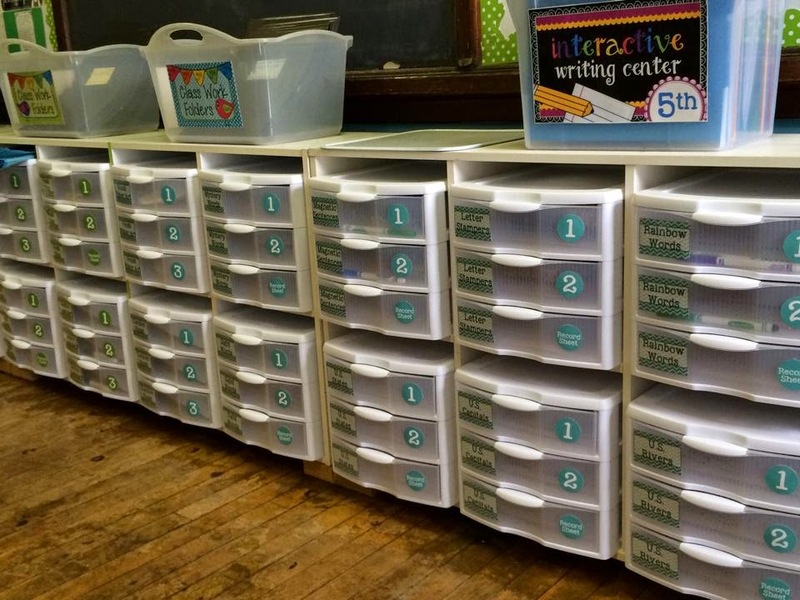 Students will take the entire drawer (either #1 or #2) AND a record sheet to their seat. You can download my word work instruction sheets and record sheets HERE. Above: All items for the activity are inside the drawer. Below: Under the materials, I have laminated and hot-glued instruction sheets so students can be as independent as possible at this time. If an activity has a record sheet, they are located in the third drawer. If the activity does not have a record sheet, there are just three drawers of the same activity. 1. Cursive Vocabulary - Students will use skinny dry erase markers on a personal wipe board to practice writing word wall words in their best cursive. 2. Vocabulary Clips - Students will match clothespins (with vocabulary words written on each one) to definitions on sentences with context. I think I will use Social Studies words for this activity. I haven't yet decided and, therefore, my clothespins are currently blank. 3. Stencil Spelling - Students will spell their current spelling words with stencils I picked up at the local teacher store. 4. Bottle Cap Spelling - Long ago, I saved water bottle caps from many cases of water. When I had enough, I wrote a letter on each one. Students will use these caps to spell out their longest spelling word for the week with the bottle caps, then then they will spell smaller words with those same letters and record their work on a record sheet. 5. Letter Cards - Students will use letter cards to spell out their weekly spelling words and take a picture of the finished product. 6. Sight Word Test - Students will test teach other on their quick reading of Dolch and Fry sight words. If they miss one, they write it down on a record sheet. They are no penalized for missing a word, but this will give me an instant list of words they need more practice with. 7. 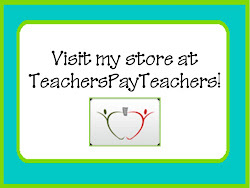 Letter Card Fun - Students will mix spelling with math using my Letter Card Fun center. Since this activity is geared toward younger students, I only used a portion of it for my older kids. 8. PA Counties - Students will identify the counties of Pennsylvania on a map. This is a tricky thing to do from memory, but I think it will be good practice (and it ties in to their 4th grade Social Studies). 9. PA Cities - same as above but they will identify PA cities. 10. PA Rivers - same as above but they will identify PA rivers. 2. 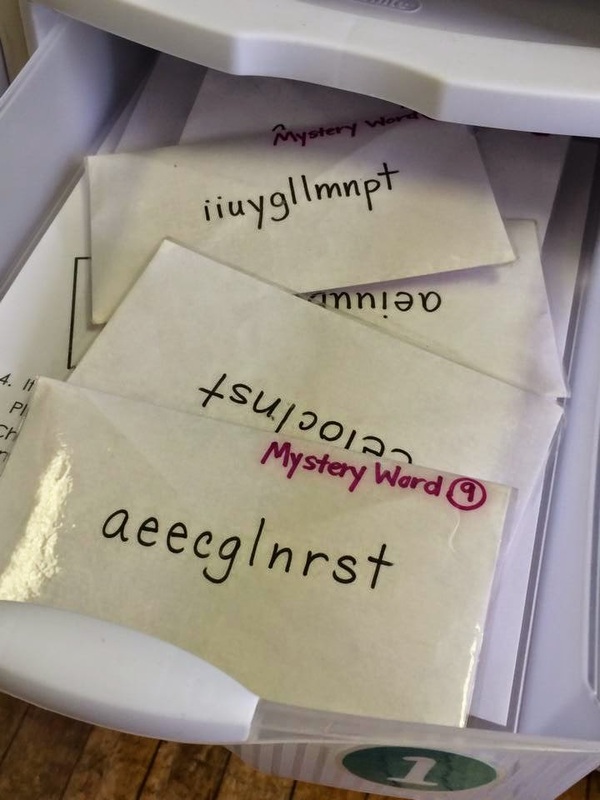 Mystery Words - I have letter cards in an envelope. 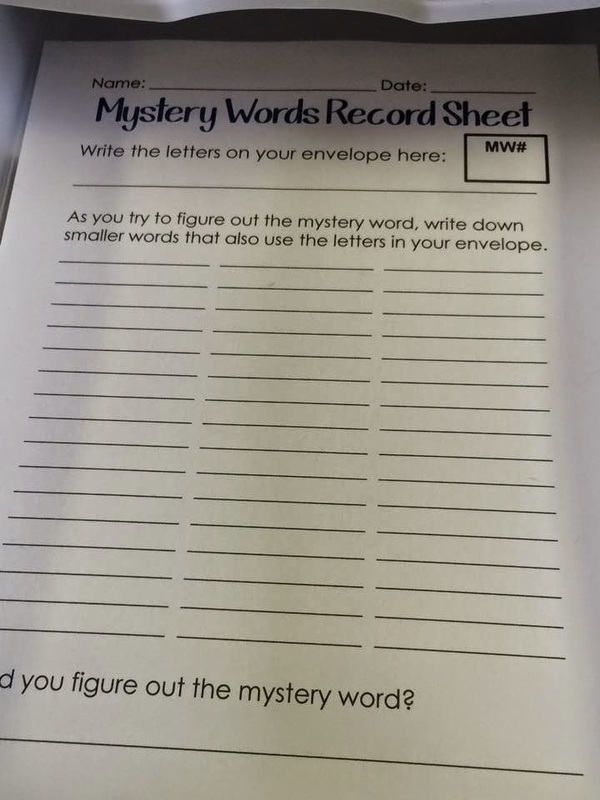 Each envelope houses only the letters needed to spell one longer mystery word. 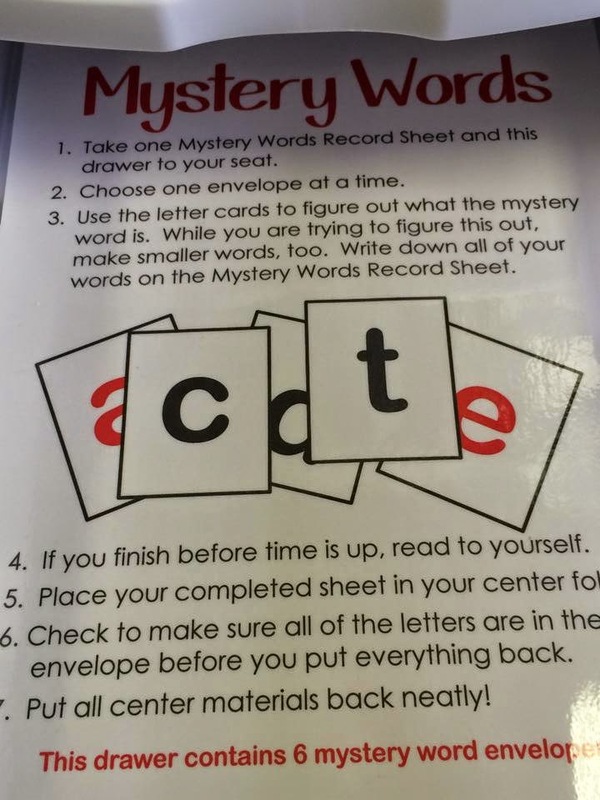 Students manipulate these cards to figure out the mystery word, but to also spell out smaller words. 3. Rainbow Words - This is an oldie, but a goodie. Students will write this week's spelling words using alternating colors of the rainbow. 4. Vocabulary Water Art - Students will write this week's vocabulary words on a coffee filter in any design they like. They will turn it in DRY, but once I give them credit for doing the assignment, they will be allowed to add droplets of water to it to create coffee filter water color art. 5. Magnetic Sentences - I bought these magnets from Lakeshore. Students will create sentences and then identify parts of speech. 6. Letter Stampers - Students will use alphabet stampers to spell out their weekly spelling words. 8. US States - Students will identify the US States on a map. 9. US Capitals - same as above but they will identify US capital cities. 10. US Rivers - same as above but they will identify major US rivers. Hope this gives someone some good ideas!